When high-power motor stalls or stops suddenly, it can generate a high-voltage surge that can damage the circuitry of the motor controller and burn out the power supply. 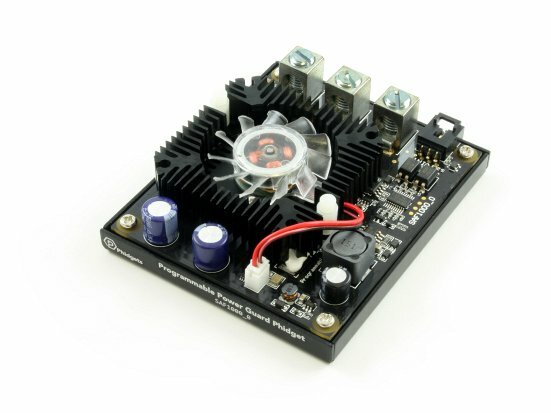 This Power Guard Phidget is designed to protect your hardware from such an event by preventing current from flowing back into the power supply, and by providing a heatsink and fan for the excess power to dissipate. This board is designed for high current systems and is capable of protecting your equipment from even the largest of power spikes. 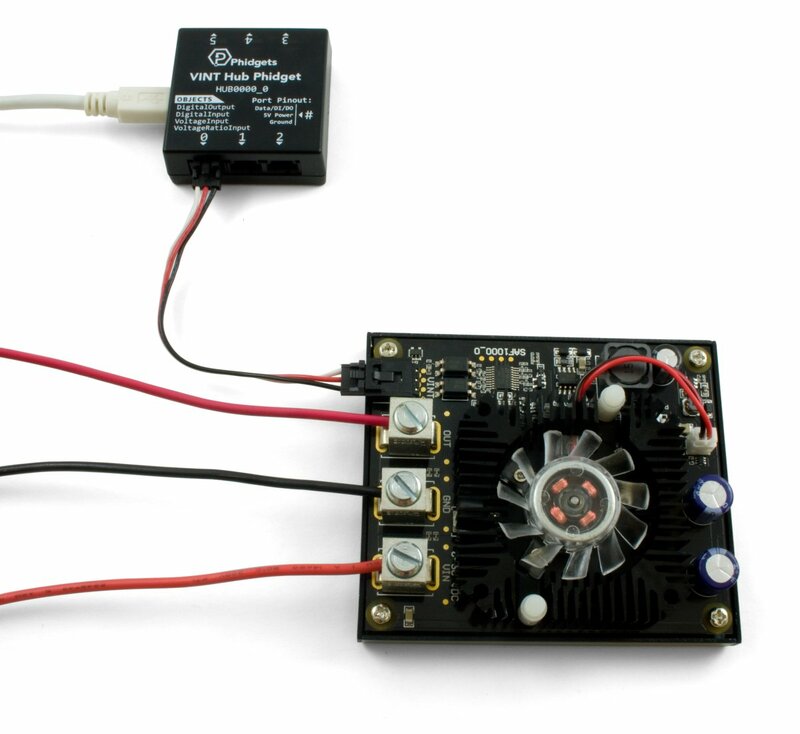 Simply connect your power supply's positive wire to the 8-30V input lug, connect your device's positive wire to the output lug, and wire both grounds to the ground lug. The SAF1000 connects to a port on a VINT Hub. See the Connection & Compatibility tab for a list of hubs. 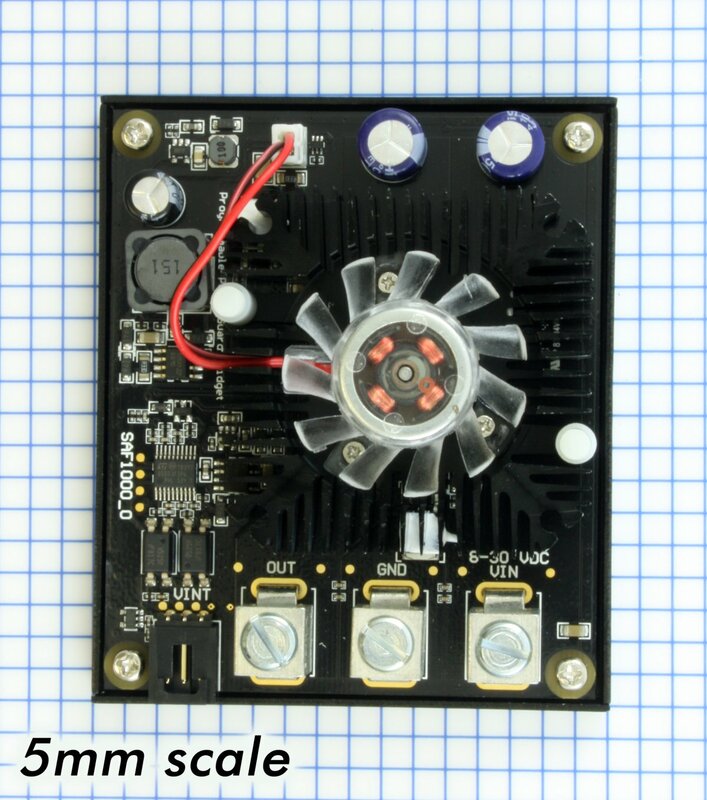 This Phidget protects a power supply between 8 and 30V DC. Check the product page or data sheet of the device being powered to determine how much current is needed and what voltage range is permissable. Select the power supply from the list below that matches your region's wall socket type. Connect the SAF1000 to your VINT Hub using the Phidget cable. Connect the positive power terminal of the device you're powering to the "OUT" terminal on the SAF1000. Connect the ground terminal of the device you're powering to the ground terminal on the SAF1000. Connect the positive and negative wires of your power supply to the "Vin" and "GND" terminals of the SAF1000, respectively. Plug in your power supply. 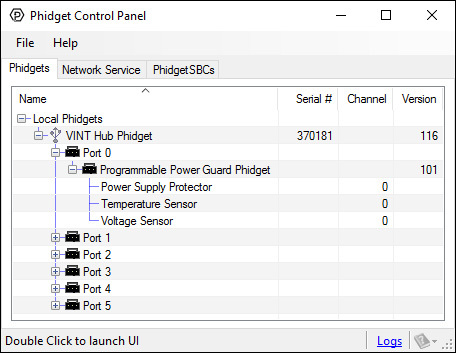 In order to demonstrate the functionality of the SAF1000, the Phidget Control Panel running on a Windows machine will be used. Linux users can follow the getting started with Linux guide and continue reading here for more information about the SAF1000. Adjust the voltage cutoff slider to determine at which voltage the SAF1000 will cut power to your system. Click the enabled box once the cutoff and fan mode are set in order to activate the SAF1000. On the left, change trigger and/or data interval can be changed. For more information on these settings, see the Data Rate/Change Trigger page. On the right, the supply voltage of the Phidget is displayed in real-time.